"Where are you going, Doctor?" Oh for a working Chameleon Circuit to disguise the Tardis! 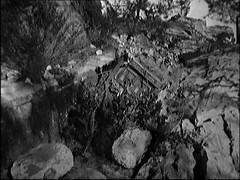 Even before the market trader reveals that they arrived a month ago it's obvious the Tardis crew have been there some while, have settled into their surroundings and are very much at home. 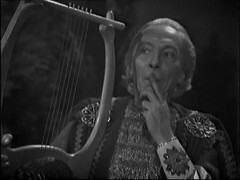 This episode is very much a set-up episode, starting from that position it serves to split the regular cast up with Ian & Barbara separately enslaved and The Doctor & Vicki involved in a case of mistaken identity/the Doctor pretending to be someone else again, following his spell impersonating an official in The Reign of Terror. 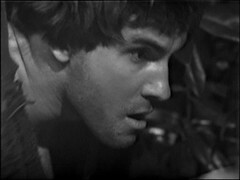 The mute Ascarius is played by Barry Jackson. For years Jackson was a jobbing actor and occasional stuntman whose CV included an appearance in the Doctorless episode Mission to the Unknown and another Doctor Who role as the Doctor's classmate Drax in the Armageddon Factor. He found a measure of fame late in life as Pathologist Doctor George Bullard in Midsomer Murders. Interestingly while Doctor Bullard is absent during the 2nd & 3rd series of Midsomer Murders he's replaced in four episodes by pathologist Dan Peterson who's played by Toby Jones who we now know as The Dream Lord from Amy's Choice! 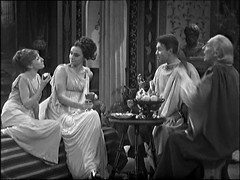 Elsewhere in the cast of this episode Nicholas Evans, on the far left, plays Didius: He was a Dalek & Slyther in The Dalek Invasion of Earth. 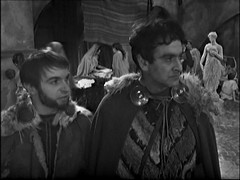 Dennis Edwards, the Centurion, later appears as Lord Gomer in the first three episodes of Invasion of Time. Edward Kelsey, on the right, is the Slave Buyer. 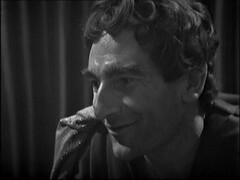 He returns as Resno in Power of the Daleks 1 & 2 and Edu in Creature from the Pit, both of which were directed by Christopher Barry who also directed the first episode of the second season of The Tripods in which he appeared as Professor Bernstein. Kelsey is best known to my generation for voicing Colonel K / Baron Silas Greenback in Dangermouse.